I love training here. If I want to train at one of the best, if not the best academy in the area, I will train here. It's not often you see multiple black belts on the mat and you have that here. Take advantage and join an academy with amazing people and culture. OSS! Phenomenal school and staff! My youngest son is autistic and the instructors take time and teach him often one on one. They take care to pair him with mature and experienced students to allow him the extra time he needs to learn the techniques. Can't say enough about the owner and this school. I dropped in for open mat today as I was visiting from out of town. Professor Ricardo and his students were the epitome of kind and hospitable. Training was everything I hoped it would be, with the bonus of Professor and his students taking the time to share some tips to improve some positions I was struggling with. I’d recommend anyone from out of town to drop in for a session. I’d also recommend that any locals interesting in training jiu jitsu do so at Da Firma. The place and people are top notch! This is one of the best academies in the country. I am in the military and I have to travel a lot. I have trained at some awesome academy's, DTC is one of the best. Professor Ricardo and everyone is awesome, friendly, and very skilled. Hope to see you on the mat there The Royce Gracie Seminar was awesome. I have been training at DaFirma Training Center (DTC) for several years. I was originally drawn to them by the quality of instruction, clean, spacious and extensive facilities. Facility: one of the largest mat areas on the entire east coast (high quality Fuji mats), separate strength and conditioning area, separate kick boxing area, comfortable seating area for family and friends of students, and large, CLEAN, male and female locker rooms (with showers). I have trained all over the country (and several places oversees) and it is honestly the nicest facility I’ve ever seen. Instruction: Head instructor, Professor Ricardo Tubbs’ curriculum is structured in a well thought out, cohesive manner. He ensures each student understands the technique, executes it properly and keeps their teammates safe. 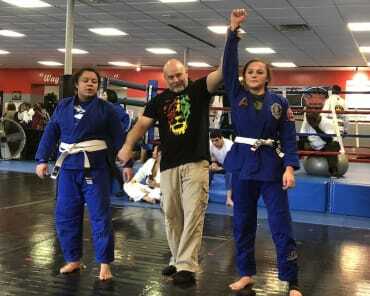 Routinely, there are multiple black belts (male and female) on the mat, participating and assisting in each class. Students: The diversity of the clientele is one of the things I enjoy most about training at DTC. We have students from all walks of life, ages, nationalities, etc. Everyone is very welcoming and treats one another with respect. Each person feels part of the team. Training Availability: There are multiple classes Monday through Saturday which accommodate the most demanding schedule. Whether you are thinking about starting Brazilian Jiu Jitsu, kickboxing, or just looking to get in shape, do yourself a favor and check them out. Da Firma Training Center is absolutely an amazing place to train. My husband, 2 children and myself all train here and it’s nothing but good vibes, great technique and it’s safe! Professor Ricardo has amazing technique and an ability to teach anyone from beginners to high-level competitors! I also have to say there is a good amount of females that train here which is always a plus! My family and I are very happy to have found our BJJ home here in VA! If you are looking for a place to train that is inclusive, very family friendly, positive learning and excellent training environment, for the youngest of minds and adults alike - then DTC is for you!!! Professor Ricardo and all of his coaches have such a fantastic approach to teaching the kids. They have mentally and physically challenged my boys (ages 3 and 5), bringing out the best in them. Jiu Jitsu has had such a positive influence on their little lives and ours too. As a parent, you get to watch to watch your kiddos grow and learn. Professor Ricardo, Coach Nick, Coach Lei, and Coach Dorian are amazing. My boys adore them. It is so much more than just the technique on the mat... The confidence and increased communication is a blessing. I'm so grateful for DTC in our lives, Professor Ricardo and all the coaches! DTC was recommended to us, and here is my recommendation to anyone unsure- come check this place out! You won't be disappointed. Da Firma Training Center is an outstanding place to train in Brazilian Jiu Jitsu. I enrolled two of my young children, ages 6 and 10 last year; they love it. Now their muscles are getting bigger than mine. Professor Ricardo Tubbs and his staff of coaches are experienced and professional. Three weeks ago I started training too; I'm addicted. The Professor and coaches are all patient and demonstrate self-defense in all of their training. Do not miss the opportunity to become a part of the team! Come out and join us now! This place always has a great atmosphere and is always very welcoming. Not only that, but has some of the greatest seminars in the area. Last night, I attended a seminar by none other than Royce Gracie! He really put on a great seminar. Great details of combative Gracie techniques taught in a way that is really cemented in my skull. Thanks for what you guys do. My 6 year old son has been going here for about 5 months so my experiences are solely based on the kids classes. Very professional/family orientated staff. Professor Ricardo and his coaching staff do an excellent job at simplifying the techniques for the younger kids and maintaining a disciplined environment. Additionally, Professor Ricardo periodically runs the children through "playground scenarios" to teach the kids how to neutralize bully situations. 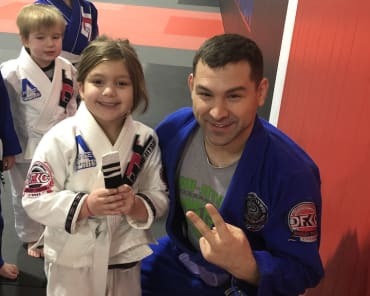 If you are unsure if your daughter/son will like it, talk to the staff and they will let you bring your kid in to try it out for a class before you commit. 2. no limit to training. If there is a Jiu Jitsu class (that you qualify to be in, which was way more classes than i thought) you can participate. Needless to say I highly recommend this place, if your considering starting Brazilian Jiu-Jitsu you should check Da Firma Training Center.(DTC). My 13 yo was not into sports. DTC changed that! He loves BJJ and the coaches. This is the best place to train and meet new friends. Everyone here is like a new family member. The best decision I've ever made... DTC! I just taught a seminar at "Da Firma Training Center Brazilian Jiu Jitsu & Athletic Performance" from Professor Ricardo Tubbs and I loved it. Very good environment and atmosphere. The students are very good level, and all nice people. Professor Ricardo is a super nice person, and also has a great Jiu-Jitsu level. It was really a pleasure to share the mat with them. I hope to come back soon, and really suggest everyone to visit or join Ricardo's school. DTC is such an awesome place with a great family atmosphere and there are not very many places that offer what you will find here. It has been a excellent experience for my entire family to get in great shape, make new friendships with such positive folks and a great group of people. We appreciate everything that Professor Ricardo and his family do to make this place so great, including having guest seminars such as the legendary Royce Gracie last night. I am so happy that we decided to join the DTC Team and give the strongest recommendation if you are looking for a great place to train. I recently attended a Royce Gracie seminar hosted by DFTC and Ricardo consistently brings in the most talented BJJ practitioners to the Hampton Roads area. He's great about having an open door policy for any BJJ practitioner to come and visit his academy. His academy has a cool vibe and the students are great people. The staff here are very inviting and knowledgeable. I always learned something new while getting a fantastic work out. As a petite woman, I find judo a great martial art for me to practice. I know I found a perfect fit for my fitness and training with the Da Firma family. Awesome instruction at a top-notch facility you can't go wrong!!! You can't leave without checking out their Gis as well!! I highly recommend!! The gym is great and really caters to every individual's needs. Whether you're young or old, in top physical shape or just getting back into things this place can accommodate. Professor Tubbs is really smart and very technical when it comes to jiu jitsu so you know you'll be learning the technique properly. His motivation to train is the reason I wake up every morning thinking about getting back on the mat. I have been training in Brazilian Jiu Jitsu(BJJ) at Da Firma since June of 2015 and I have to say that there is no where else I would rather train. Da Firma is family centered, family owned and right from the moment you walk in the door you are treated like family. From your first lesson you are taught real world, practical self defense. The quality of training is unlike any other anywhere. Not just in Hampton Roads, I mean ANYWHERE. In addition to the top notch training that he offers, Professor Ricardo has continued time and time again to bring the best of the best in the world to come and teach. I admire Professor's commitment to bring the highest quality training possible not just to enhance our gym but to build up and enhance the entire jiu jitsu community. The other programs offered at Da Firma are of the same high quality as the BJJ program. My wife is now training in the Muay Thai program with Antwain Britt and she is loving it! Only rating five stars because ten isn't an option! UPDATE: Yesterday DaFirma Training Center hosted a seminar by Royce Gracie. It was outstanding! The opportunity to meet, train and learn from one of the most influential people in Brazilian Jiu Jitsu was an amazing privilege. This was a great reminder of Professor Ricardo's commitment to bring the highest quality Jiu Jitsu and self defense training to his students. Thank you Professor! This academy is great. It's clean, the instructors are welcoming and extremely knowledgeable, and the level of training is incredible. I have been training no gi here once a week for a little over a year now, and all I can say is I'm blessed to know the people that run and train at this facility. Having two black belts in house makes for a great learning environment. They motivate and encourage their team and any visitors that they share the mat with. If you are in Chesapeake and need somewhere to train bjj or work on strength and conditioning, maybe yoga is your thing, they have it, I encourage you to check them out! Professor Ricardo, Coach Wanda, and all the staff and members are such wonderful people; it's as if you are home with family. Your kids will experience an environment of fun and creative energy, and at the same time train their bodies and minds without realizing it. I firmly believe that's the best way to raise kids, having all the support of a family-oriented jiu jitsu academy, and DTC exemplifies this!! DTC: family, integrity, humility, respect -- at its finest. Make your way to Chesapeake and go check them out!!! Ricardo has a passion for Jiu-Jitsu like no other. He has built an amazing facility and hired a world class coach in Dalua. He provides the highest quality in everything he does and this training center is no exception. The minute you walk in the door you are treated like an old friend who has made their way home. If you are in the Chesapeake VA area, this is the place to be! Beautiful facility with a friendly knowledgeable staff. The students are very welcoming and the jiu jitsu instruction is world class. I have trained at many different Brazilian Jiu Jitsu facilities throughout the world over the years and I can say without a doubt Da Tirma Training Center is one of the best in the world. I started training here in October after a year plus layoff from grappling. Coming back to the mat as a very out of shape purple belt can be daunting. Are people going to see a new person on the mat and smell blood in the water? Is the instructor going to send his best students after you to prove how good they are? A good training atmosphere starts from the top and coming to a new place, you just never know. Thankfully, stepping onto the mat at DTC, even for the very first time, is like coming back to home to train with your best friends. Everyone greets you, makes you feel at home and, most of all, is happy to help you with anything you need. In addition to the vibe, the instruction is top notch. Class content ranges from basic jiu jitsu with plenty of details to rarer, more specialized techniques. Stand up grappling and self defense are part of the standard curriculum. If you want to cross-train, there's judo once a week, and Muay Thai (kickboxing) more often than that. There are many, many places to train in Hampton Roads, but eight years into my jiu jitsu career, there's nowhere I'd rather call home! Anytime I come to town, Professor Ricardo welcomes me into the mats without hesitation! He is a dear friend, great businessman and even better military man! He is very kind hearted and amazing instructor! At DTC you don't only get to train in a world class environment, you get to train under world class instructors! I definitely encourage anyone interested in jiu jitsu to go check them out! You won't be disappointed!!! My son and husband both train at DTC. They've been attending classes for three months now and absolutely love it! My son is very lucky to have Professor Ricardo as his instructor because he has the patience of a saint with those little four, five, and six year olds. They absolutely adore him, but he gives them structure and discipline in an entertaining way. Also, my husband has nothing but great things to say about his training at DTC. They both will be members for a long time. I am a Jiu-Jitsu Professor in Idaho. I recently visited this school! I am very impressed with the instruction, leadership and vibe of the school. I would highly recommend Da Firma Training Center. There is no better schools in the Tidewater/ Hampton Roads area. Beautiful facility, excellent instructors, friendly atmosphere. This is the place to train if you want to be a champion or if you just want to get a great workout. The people here are so welcoming and I can't wait to come back. The culture and the philosophy that these people preach reminds me of why I became a martial artist in the first place. My name is Marcello Alcantar and I received my blackbelt from Xande Ribeiro. When I am in town this is where I train! After leaving my home state I have been searching for a place to continue training Martial Arts. I am blessed to be a part of this team and Dojo. Awesome passionate BJJ Professors with an active pro MMA fighter and PAN AM Champion Professor Jean Dalua Cartagena that is the head Professor. Join and stop by and see the passion and level of this team. I stay with this gym because of legit fighters and trainers like Professor Dalua. Get the honor of a private lesson from this Champion! Well, where do I start. This company is really all about their clients and client satisfaction. The owner Ricardo takes real pride in his products which is obvious. We own a BJJ gym and we have been through a number of Gi companies. They all mostly had good products and their customer service would start out good but after a while they all went down hill. This is not the case with Da Firma. I don't know if it's Ricardo's military values or what but he is always loyal to his customers and his products. Oh and to top of off the gear he sells is awesome. Great fit good pricing and it fits currents styles. Also their training facility is top notch. Prof Dalua is a great coach and the facility is well taken care of. I.e. Clean!!!! Amazing facility. Top notch instruction. Being a below knee amputee, I almost didn't go into the school because I didn't think I would be able to do it. Professors Jean Dalua Cartagena and Ricardo Tubbs didn't even hesitate to tell me they would be happy to train me and I'll be forever grateful to them. Not only is Jiu Jitsu learned there, but respect, humility, and the concept of family and work ethic are as well. The instructor at DaFirma BJJ Professor Ricardo is a real stand up guy. All about the people and his family. Very proud to call him a friend. As a blackbelt instructor myself I definitely recommend this team. DTC offers the best Jiu Jitsu in the area. Ricardo and Prof Dalua are great instructors with a genuine interest in the progression of their students. They love what they do and it shows. If you want to learn BJJ in a professionally operated, family oriented academy, or if you want to train to be a champion competitor, then this is the place. My 4-year old started classes a few months ago and he has come such a long way! Professor and the coaches are patient, yet firm with these young kids and are teaching them about discipline and bullying and respect. Top level jiu jitsu with one of the most humble instructors you will ever meet, not to mention a world champion. Definitely worth the visit. I'm truly blessed with the opportunity to train at this gym. I have trained at 7 different gyms before including 4 in the Hampton Roads area and I can't stress enough how welcoming this facility is. 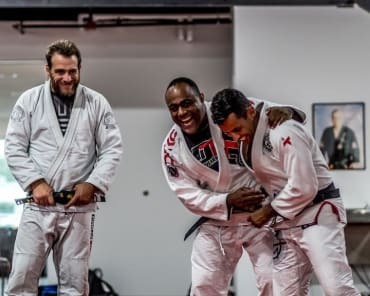 Doesn't matter if your experienced or starting Jiu Jitsu for the first time, Professor Dalua and Professor Ricardo will welcome you with open arms and immediately make you feel like your part of the family. You can be looking towards competing or simply looking for a place to train with your children. Whichever the case may be, this gym has everything you need to take your skills to the next level while having a great time doing so. Not to mention our professors are active competitors which you don't find to often at other gyms and the owner of the best Gi company know to man. I challenge you to reach every goal in your life by simply taking the time to check out Da Firma Training in Center in Chesapeake, VA and I guarantee you won't be disappointed. Da Firma Training Center has everything you could want to get healthy! DFTC is among the best BJJ gyms that I have had the opportunity to train at. They not only have high-level instructors but they also have a variety of other programs, such as yoga and strength training. If you are in the area... go check it out! I could not be more impressed by Da Firma Training Center Brazilian Jiu Jitsu. I reached out to Ricardo and Wanda to surprise my husband with the Faria seminar as a birthday gift. I told them we live in NY and I wanted to plan his flights, hotel, etc. Not only did they make it super easy for me to purchase the seminar and add me to the Da Firma site and calendar, they offered me help finding a hotel, and other information to make this as easy for me as possible. I had a thousand questions and they were available by phone and Facebook. Thank you so much Ricardo and Wanda for going the extra mile and being great ambassadors of the BJJ community. If you are in the Chesapeake, Great Bridge, DTC is the place to train Jiu-Jitsu. Professor Ricardo and his staff are very passionate about Jiu-Jitsu. The staff works and encourages you to work hard. It is not easy but in time and the more you attend class you will become better. All the students are helpful and encourage everyone to get better. I have been there since February 2016 and have never had a bad experience. Professor Ricardo brings in well known instructors to teach the class and for seminars. Highly recommend the DTC to train in Jiu- Jitsu and now they have Kickboxing. Give it a try and you will say I should have done this sooner. You will learn as you go to class. Everyone starts out as a beginner. Great place to work out, Highly recommend the DaFirma Training Center. I have trained at countless schools and DFTC is by far at the top of my list! Aside from the warm welcoming vibe, it is clean, organized, and the staff is extremely professional. What I loved most was the comradely between everyone and the willingness to help each other get better. I learned so much and I can't wait to go back! I have been training one day a week at this gym for a little over a year now for supplemental training. I am very impressed. The technical instruction is elite level from both of the black belts at da firma. Not only that, they also are big supporters of their students and the bjj community in general. The years of dedication to the gentle art is ever present when training in this facility. The facility itself is very clean and well maintained. This is by far one of the best places to train in Virginia. I've been to only three classes, but in every single one I feel welcomed and that I'm really learning something that benefits me. While learning the moves, I'm also gaining strength and confidence. It's a fantastic place to be a part of, and I hope you all will join as well! Very welcoming vibe at DTC and you'll get a great workout! In town for work and this gym was recommended to me. I am very happy with my decision to train here for the week. Thanks Professor Ricardo! Stopped by several Dojos searching for a place in VA to continue training since leaving IL. I joined DTC within 72 hours of attending a class. These instructors/professors are passionate and legit. I'm sure to hit my goals with these pros and excited to learn another Martial Arts from a new part of the world for me. Absolutely amazing people and instruction at this awesome academy! If you have a chance, stop by and check them out. Virginia has got it well. Professor Tubbs allowed myself and a couple other soldiers came and train at his academy when we were at anuial training for the summer. Got some good training in at a clean and professional academy. Would recommend it to anyone passing through or moving to the Norfolk VA beach area. Just finished belt testing at Da Firma and it was great! The owner/instructors put a lot into the testing so it really feels transformative. Lots of people there to support as well, it was like an event. Great place. I'm a below knee amputee and the day that I walked in to inquire about classes, Professor Jean Dalua Cartagena didn't even hesitate to answer that he would train me. That aside, I have learned that you can tell a lot about a business by the people who patronize it. And I realized quickly that the people that I met my first night in class were not simply students, but were a family. One I am now grateful and proud to say I am a member of. DA Firma Training Center is great for everyone who wants to learn Brazilian Jiu Jitsu or just wants to get in shape. Ricardo and Prof. Dalua and awesome and they care about there students. They also take the extra time to answer any questions after class that the students have. The more experienced student there want to help you learn and motivate you and dont look down on the newer students. I love this place and would recommend it to everyone who wants to be part of a caring Jiu Jitsu family.